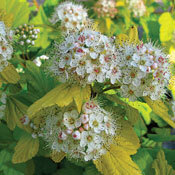 Physocarpus (pronounced fy-so-KAR-pus), commonly referred to as Ninebark are shrubs grown for their eye-catching leaves and peeling bark, it also bears extremely beautiful white flowers. 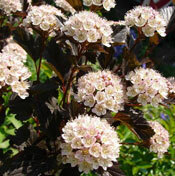 The blossoms grow in corymbs, a grouping of flowers where the lower flowers have longer stems creating a flower-head that loosely resembles the flat-topped cap of a mushroom. 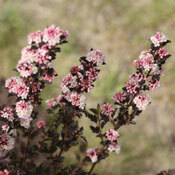 They are most often used as a privacy screen or hedge, or in a naturalized planting. 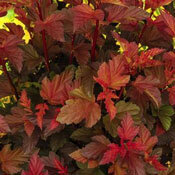 All of our Physocarpus Plants for sale are shipped with very well-established root systems. We guarantee them to arrive alive and thriving.